Terminator 2 slot is an online video slot game powered by Microgaming casino software. It is a 5 reels and 243 Paylines game (during free spin feature it becomes 1024 paylines), which offers a jackpot of 300 times of players total bet. The slot game is inspired by the famous movie Terminator. T2 symbol is the wild card of the game and Orb Icon is the scatter of the game. Play Terminator II with real money at these Microgaming casinos. The options available in this game are ‘bet” which is used to select the total wager for a be, “Coins” which is used to choose the number of coins to bet, ‘coin size’ is used to select the coin value, ‘Spin” option is used to place the reels in motion and “Auto Play” option is used when you want to play the for a number of times without any interruption. A player will have to choose coins size and will have to adjust his coins before hitting the spin button in this game. Max coins per line for the game are 10 and minimum coins per line are 1. Just like this Minimum coins size is 0.01 and max coins size is 1. It means a player can play the game from £0.30 – £150.00 a spin. The free spin feature will be triggered when 3 or more Orb icons appear on the active reels. Players will receive 10 Free Spins during these features. Only 1 Orb Icon is needed to appear on active reels to activate free spin feature during T-800 Vision round. 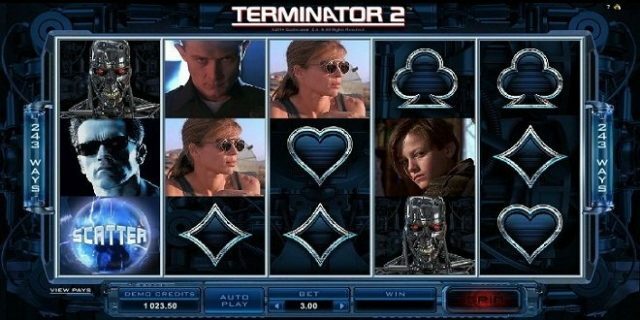 The symbols of the game include terminators like John Connor, T-1000, Sara Connor or T-800.